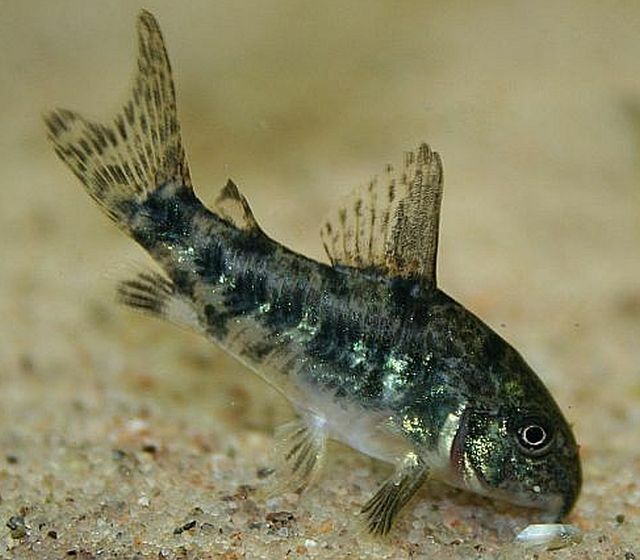 The Peppered Cory Cat (Corydoras paleatus) is a species that comes from the lower Paraná River basin and coastal rivers of Uruguay and Brazil. They are often referred to by tropical fish keeping enthusiasts as the Blue Leopard Corydora, Mottled Corydora and Peppered Catfish. The Peppered Cory Cat is an active, peaceful, bottom dwelling scavenger that has a black and dark green spotted body with a white underbelly. Males are smaller than the females, and in proportion to their body length; the dorsal and pectoral fins are longer on the male than on the females. The Peppered Cory Cat does best in a densely planted aquarium with some floating plants and plenty of hiding places to give them some relief from direct lighting. Although they like to nibble on algae that grows on floating plants , they are not a specialized algae eating catfish. Because their barbels are easily damaged, a sandy or fine gravel substrate is recommended, along with some driftwood or bogwood (also known as mopani wood) to mimic their natural habitat. These catfish enjoy the company of their own kind and should ideally be kept in small schools of six or more individuals. The Peppered Cory Cat will occasionally dart to the top of the tank to take a gulp of air. They can use atmospheric oxygen to supplement what their gills extract from the water and will do this more frequently when the water quality in the aquarium is starting to deteriorate. The Peppered Cory Cat is easy to breed once a pair is identified and keeping a number of individuals together until they pair off is the easiest way to do this. Like all Corydoras, Peppered Cory Cats are egg depositors and will lay their eggs in almost any place in the aquarium. The courtship ritual entails the male chasing the female around the tank until she is ready to spawn. The males shivers over the female and occasionally will lie down on top of her. The female turns to the male and pounds furiously below his ventral fin until the male releases his milt. The female catches the milt in her mouth, cups her ventral fins and lays about 3 or 4 few eggs in them. The female will then clean off a spot where she deposits the eggs. This continues until spawning is completed. The eggs will normally hatch in about 6 days, and the fry should be free swimming 5 days later. Because the parents occasionally eat their fry, most tropical fish keeping enthusiasts remove the pair from the tank until the fry are able to fend for themselves. Normally the fry will eat the small organisms already in the tank until baby brine shrimp or finely crushed flake food can be eaten. The Peppered Cory Cat is omnivorous and requires a well balanced diet of live, frozen or freeze dried bloodworms, daphnia , brine shrimp , tubifex , shrimp pellets, sinking catfish pellets, and a quality flake food. An occasional “treat” of blanched spinach is also appreciated. Peppered Cory Cats are common in the aquarium trade and are usually available for purchase at a size of 3/4″ to 1″ in length.